It's finally winter weather. I've broken out my black and white tweed coat. While I hate shivering in the cold every time I step a foot outside, I have to say it puts me more in the spirit for the holidays. Speaking of which, Thanksgiving is this Thursday.....ummm what!? You better believe I'll be pigging out on my favorite dish: pumpkin pie. Speaking of cold weather though, this was the first time taking blog photos this season that I was actually freezing cold. I don't know how anyone does it! So many of the photos were of me with clenched fists and outrageously blown hair, that I decided to not include them. Quality over quantity, right? Pssstt......there may or may not be a giveaway listed at the end of this post! Lately, I've been into the whole cold shoulder trend. This is my second cold shoulder top, and I must say I'm obsessed! If you're petite, this style will flatter you incredibly well! This black cold shoulder top has a gold zipper down the front which can be adjusted depending on how much cleavage you're wanting to show. If you have a delicate gold pendent, that would go perfectly with this top. I love that this top can be dressed up or down. If you're feeling sporty, throw some tennis shoes on instead of the booties. Best of all, the material is incredibly soft and cool; it has a polyester, sport feeling to it. The long sleeve top is roomy and has flattering rouching on the sides. And might I add this top is slightly over $5.....such an affordable staple for your closet! And these are my new babies!The chunky heel on these booties makes it incredible easy to walk in. I don't have any opened toed booties, so I'm excited to add these to my collection. Plus I normally go for black or brown booties, so I decided to expand my horizon. 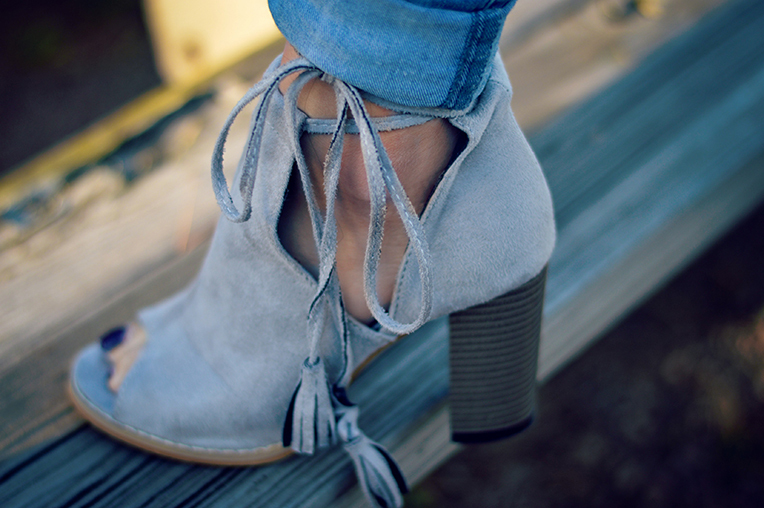 I love that these booties are a cool toned grey and go awesome with booties. The tassel and wrap detailing make them super trendy. For size reference, I ordered my usual size 38, The back has a slight gap on the heel, but it's nothing that noticeable. Plus these badboys are under $30; what a steal for a trendy booties! I wished they came in more colors. Since it's Christmas season, Sammydress is having a giveaway for you guys. The winner will be choosen to win a $100 giftcard. All you have to do is leave a comment down below with the hyperlink of your favorite clothing item from this list . Also don't forget to include your email! A special thanks to Sammydress for providing this giveaway opportunity! For more fashion inspiration, check out how these guys and girls are styling their fashion and winter attire. Also, Feel free to check out their promotional Facebook page as well as their fashion Facebook page . Girl!!! Those shoes, That top, those jeans!! You look amazing! I love how the top is definitely in style and you can find something similar to it pretty much anywhere! I think im in love with your shoes! You look so cute girl! Yeah it's hard to take pics with bad weather lol, but it comes with the job!